More and more claims about the refereing and “microfouls” in particular appear. On the part of the viewer had a claim to some athletes who give a hand without a fight in order to save power. According to the audience, such "tricks" harming entertainment and deprive fans of beautiful fights. 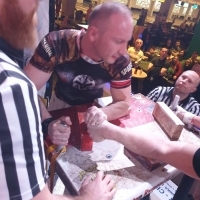 "Of course, often microfouls do not affect the outcome of the match but play a negative role for the entertainment arm wrestling. But it’s not an easy task to assess microfoul and simple foul, and this decision depends on the competence of referees. And if in the rules of competition is written, that any separation of the elbow, or in other words the loss of elbow contact with pad, is a foul, it is necessary to comply with this condition perfectly. The use of any technical means (cameras, sensors, etc. ), of course, are welcomed. Any Olympic sport uses cameras and a variety of technical means, and even if an athlete set a record, for example, in the long jump with a spade line, the result would not be counted. Likewise, in the armwrestling, if you picked up your elbow – there was a foul. Of course, I agree that referees even on high-level competitions commit mistakes that lead to fatal consequences and decide the outcome of fights. In general we don’t have schools for referees, even seminars are rare. So the solution of this problem may just be to use additional equipment and facilities, which will help the referees to give an objective assessment of the fights", – said Dmitry. "On the issue of “giveaways” I can say that every professional athlete should be able to calculate the strength so as to successfully reach the final. And any tactics is good. It is foolish to go against an opponent who is potentially stronger, and give all the power to one match. Or lose to have some prize place. It is not so entertaining, of course, but sportsman make such a decision. But often, I can tell by example, the ambitions are gaining the upper hand, and you laid out in such situations before the end, and then it’s impossible to pull anymore". In our opinion, the story of Dmitry Beskorovaynyi is very logical and reasonable. And what do you think about this? Soon we will publish the opinion of another expert on these issues. Stay with us and stay tuned to armpower.net.